Archie the Kangaroo ruled the boxing circuits of Australia for years after he was captured and trained by his master, Sidney Fawkes. Archie's celebrity made Sidney a wealthy man, and the two have been best friends ever since. However, a rare Australian blood disease has rendered Sidney incapacitated, leaving Archie to fend for his master and himself. His wish - to find a cure! Archie may be a kangaroo, but with his swift foot work and training he can bout with the best of them! His unique power, the Thunder Trample, gives him a steady advantage over other combatants, since he can use his Stomp cards to block any other Punch Card that is thrown his way. In playtesting, Archie was a great character for new players to pick up and get started with, since his ability was immediately useful and understandable, and didn't require a lot of strategy to use effectively. Since his Stomp cards can block just about any Punch or Counter thrown his way, with a good hand, Archie can get out of just about any jam he finds himself in. It's really difficult to Haymaker Archie when he can use some fancy footwork to block you! The Thunder From Down Under lends himself well to new players, or players who want to have a basic play style with not a lot of frills - just draw cards and play the field. No need to worry about health advantage and card draw; solid play and good cards win the day for Archie. The key to playing Archie is maintaining a good hand - try to hold onto Stomp cards as you draw them, but don't be precious about throwing them out there in high pressure situations. Try to look for combos within the cards you have, and use what people are throwing at you to turn the tide with some well timed Stomps. 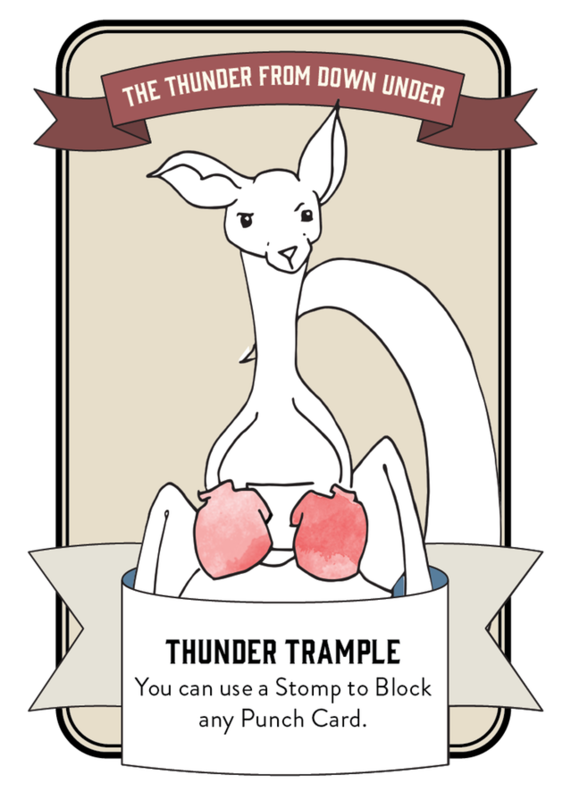 The Thunder From Down Under has his share of drawbacks, notably that his ability really only is effective when you have Stomps in hand. An easy counter to Archie is to throw Stomps at him - since he can use Stomps to block anything, forcing him to use a Stomp to block a Stomp is a bad trade for him, unless he accepts the health loss. Our tip: Don't be afraid to take the Jab, Stomp, or Spit to the face, even when you have the Stomp to block it, because you will really be thankful for having that Stomp when the Haymakers start flying! Play Archie like a strong jawed boxer - take it on the chin, and then creatively block and counter for the big hits when you have the right set up! When you hold a Haymaker and a Stomp of the same color in your hand, you can turn any punch towards you into a massive swing. Additionally, play some mind games with your opponents - you don't need to have Stomps in your hand to make your opponent think twice about swinging at you. An effective bluff can be as good as a great hand, any day, unless you're playing Knifey-Spoony, which would put you at a huge disadvantage.